For the third time this season, the Devils extended a game past 60 minutes and for the third time this season, they lost. They fell to the New York Islanders 4-3 at Prudential Center in a good back-and-forth game. It was Hockey Fights Cancer Night at The Rock on this Friday after Thanksgiving. The Devils warmed up in special lavender “Hockey Fights Cancer” jerseys that were later auctioned off to fans for charity. The dasher board ads were also in lavender to continue with the theme and the Devils had a special honorary assistant coach for the evening. Bennett Bargida, an 11-year-old leukemia survivor and youth hockey player, served in the role and also dropped the ceremonial first puck in a faceoff between the Devils’ Brian Boyle and the Islanders captain Anders Lee. In addition to that, there were some returns and other injury-related moves. The Devils just got Nico Hischier back last game from his thumb injury and Jesper Bratt was able to drop the full face shield for a half-shield, having fully recovered from his broken jaw. In addition, the Devils got Sami Vatanen and Boyle back for this game from the injured reserve. The team, however also lost Joey Anderson to IR, with coach John Hynes saying that his lower body injury is “fairly serious.” We will see how much time Anderson spends out. With Vatanen and Boyle back in, Egor Yakovlev was a healthy scratch on defense while Drew Stafford and Stefan Noesen sat up front. For Noesen, this was his second straight game as a scratch. In nets, the Devils once again went back to Keith Kinkaid. He stopped 31 of 35 shots faced. Those saves included two point blank saves early in the game off the sticks of Anthony Beauvillier and Josh Bailey. The Islanders went with Thomas Greiss, who made 39 saves on 42 shots and was, again, almost impossible for the Devils to solve. The German goalie shutout the Devils for the first four periods he faced them, including the first meeting this season in Brooklyn and the first period tonight. He would emerge victorious and get the W.
The Devils would face a nice opportunity to beat Greiss early in the first period. The goalie himself was called for interfering with Miles Wood at the 3:43 mark. On the first play after the faceoff, Leo Komarov shot the puck the length of the rink to clear, but also shot it over the glass resulting in a delay of game penalty that put the Devils up 5-on-3 for 1:47. But they would not score. Both teams would finish the day 0-for-3 with the man advantage as the Devils power play woes and penalty killing prowess continue. It was not without trying though, the Devils fired eight power play shots and one shorthanded shot at Greiss. The Isles mustered five PP shots at Long Island-native Kinkaid. The Islanders got on the board first, scoring at 7:24 when Jordan Eberle went backhand to beat Kinkaid. Beauvillier had the lone assist as he recovered the puck in the neutral zone off of a Devils turnover. The Isles had seemingly doubled their lead early in the second period when Bailey scored. The Devils would use their coach’s challenge to see if New York was offsides on the play. The call on the ice was a good goal, but a quick look at the video by the officials showed they were offsides and the goal was called back. It was a big break for the Devils and one that they would soon capitalize on. At the 11:48 mark of the second period, Taylor Hall finally solved Greiss. He scored unassisted to tie the game at one. It came when Hall won the faceoff in the Isles’ zone. The puck was worked back to Andy Greene at the point by Hischier. He shot wide and Kyle Palmieri and Hall went to work digging it out of the corner. It eventually got to the front of the net and Hall was able to chip it by Greiss. A dirty goal and one that the Devils needed. But it would only take less than three minutes for the Islanders to retake the lead. Lee scored at 14:14 from Valteri Filppula and Scott Mayfield. Kinkaid had lost his stick on the play and Filppula made a nice pass to Lee, who was uncontested in front of the Devils’ net. That goal made it 2-1 Isles. That would take us to the third period. And just 2:43 into that frame, who else would score but the hero of the hour, Brian Boyle. Boyle scored from Blake Coleman and Vatanen to tie things at two. It was a redirection after Vatanen walked the blue line, playing catch with Will Butcher. Vatanen gave the puck to Coleman at the point, who stopped quickly to shake off an Islander defender, and shot. Boyle redirected the shot by Greiss and the game was knotted at two. But the Devils kept letting New York back into things. Nick Leddy gave the Isles the 3-2 lead when he scored his first of the season. Leddy caught the Devils in a change and went end-to-end, scoring on his own rebound at 12:45. Filppula had the lone assist on the goal. Things looked bleak for the Devils when Greiss stopped Palmieri late on a partial breakaway. Palmieri had split the New York D and was in all alone, but Greiss made the save with his right arm. The Devils would then pull Kinkaid with about 1:38 left in the game. With that, the Isles had a few shots at putting things away. They kept firing at the open net and kept icing the puck, bringing the faceoff down into their defensive zone. With a need to tie things, the Devils got one of those icings and turned it into gold. With eleven seconds remaining in the game, the Devils worked the perimeter of the Islanders’ zone. Hall played catch with Butcher at the point. Hall fired a shot on net and Marcus Johansson was johnny on the spot. He pounced on the rebound and jammed home a second try to tie things up at three with less than a dozen seconds remaining in regulation. It was his first goal since November 1 and his third of the season. And with that, we were off to overtime. It was more back-and-forth action as the two teams looked for that second point. Finally, at 3:40 of the extra session, Mat Barzal broke in on a partial break on Kinkaid. He shot and then tucked his own rebound in for the New York win. It was a tough blow for the Devils, who now are 0-3 in overtime games this season. But once again, the Devils outshot their opponents, something that is becoming a bit of a trend of late. The teams split the game’s 60 faceoffs 50-50. The Islanders outhit New Jersey 28 to 23 and blocked more shots, 13 to 10. They also had less giveaways (11-4) than the Devils. Individually, Sami Vatanen was right back on the horse, leading all Devils’ skaters with 22:42 (three minutes on the power play and 1:16 on the penalty kill). Taylor Hall, who was being double shifted most of the game, led all forwards in time on ice with 22:02 (3:04 on the PP). Miles Wood, who had a good game, had five shots on goal, leading in that category while Boyle led in hits with five. Andy Greene and Ben Lovejoy blocked the most shots with two each and Coleman, Jesper Bratt and Greene each had two takeaways, which was good to lead there. Next up, the Devils travel down to the Sunshine State for a back-to-back pair with the Lightning and Panthers. First up, Sunday night at 7 PM when they go to Tampa to take on the Bolts. We will, of course, have coverage for you right here following that game. See you then! The Devils pretty much threw everything but the kitchen sink at Thomas Greiss, but the Islanders netminder had an answer for everything. The Devils suffered what was possibly their most frustrating loss in a series of them tonight to New York, 3-0 at Barclays Center. The day began with news of a huge shakeup to the Devils lineup as Pavel Zacha and Kevin Rooney were sent down to Binghamton with the Devils calling up Kurtis Gabriel and Brett Seney. Seney was the big one here, as he was making his NHL debut. Coach John Hynes said that Seney and Gabriel made “good impressions” at camp and “were difficult cuts for us” and thus were called up in place of the struggling Zacha and Stefan Noesen, who was placed on injured reserve earlier today with an upper body injury. Seney would play on a line with Blake Coleman and Drew Stafford, who was activated off of IR today as well. Seney, who wore number 43 for the Devils, was actually the final draft pick made by Lou Lamoriello for the Devils organization according to Leo Scaglione, Jr., who works on the beat for the Binghamton Devils and was interviewed by MSG+’s Erika Wachter tonight. Now we would see how he would play with Lou in the building, now with the Islanders. For his part, Zacha was being sent down as a “wake up call” to boost his confidence. He would get to play in all situations for Binghamton from 5-on-5 to 3-on-3, shootouts, power play and penalty kill. He did register an assist on a goal against the Lehigh Valley Phantoms tonight. The Isles have been a bit of a surprise story this young season, as they came into the game 7-4-1 with 15 points and a four-game winning streak. New York had recently beaten the Penguins back-to-back in a home-and-home series, taking all four points from them. They would finish the night atop the Metropolitan Division, passing those same Penguins. The Devils had lost five of their last six and would end the night at NHL .500 with a 5-5-1 record. Scratched for the Devils tonight were Joey Anderson, Eddie Lack and Egor Yakovlev. In goal, Long Island-native Keith Kinkaid got the nod and played mostly great all night. He stopped 30 of the Islanders’ 32 shots on him. New York would end the night with 33 shots as they would add an empty net goal. Kinkaid may have played well, but Greiss was simply brilliant tonight. He stopped all 35 of the Devils’ shots in taking home first star honors in the game. Among his highlights, he stopped Kyle Palmieri and Taylor Hall on a Devils 2-on-0 midway through the second period by poke checking the puck away from Hall and then stopping the followup shot. The power play was something that gave the Devils fits. They went 0-for-4 with the man advantage with seven shots but just could not solve Greiss or the Isles’ newly improved team defense courtesy new coach/Stanley Cup champion Barry Trotz. New York would end the night 1-for-4 on the power play with seven shots as well. Greiss also stopped two Devils shorthanded shots. Jordan Eberle began the scoring at 7:43 of the first period when he put home a rebound given up by Kinkaid off an Anders Lee shot. Josh Bailey had the secondary assist on that goal, which would hold up for the majority of the night. That goal came on the power play while Jean-Sebastien Dea was in the box for hooking. From there, we settled in for a goaltender’s duel. In the third frame, the Devils put pressure on the offensive zone for almost the whole period, with Greiss standing tall and frustrating New Jersey. Brock Nelson put the game just a little bit more out of the Devils’ reach at the 15:06 mark of third when he scored on a 2-on-1. Sami Vatanen may have inadvertently redirected the shot in with his stick trying to make a defensive play. That made it 2-0 Islanders and Bailey had the lone assist. New Jersey would pull Kinkaid with about 2:15 left in the game, struggling in vain to get the equalizers. At 18:12, the Isles took delay of game bench minor that would put the Devils on the 6-on-4 power play (with Kinkaid pulled) to end the game. Unfortunately for the Devils, that gave New York the ability to shoot at the open net with impunity with no fear of icing the puck. Eventually, Scott Mayfield scored unassisted at 19:46 to make it 3-0. But the last seconds were not without their close calls for the Devils. Hall made a nice save to avoid an empty netter earlier on that led to the Devils breaking up ice and Kyle Palmieri nearly scoring by batting the puck out of the air and into an open net. His shot sailed over the crossbar and the Devils simply could not tie things up. The game ended with the Mayfield empty netter. The Devils have now been outscored 31-17 during this losing streak after taking the shut out loss tonight. Statistically, New Jersey played well, winning 55-percent of the game’s faceoffs and outshooting the Isles. However, they were outhit 21-20 and New York had more blocked shots (20-13). Individually, Nico Hischier led all skaters in ice time with 20:52 (4:14 on the power play and 1:16 on the penalty kill). Vatanen led the defensemen with 20:31 (2:34 on the power play and 1:29 on the PK). Hischier and Miles Wood tied for the shots on goal lead with four apiece. Coleman had a whopping six hits to lead there and Andy Greene led in blocked shots with four. Hischier, Travis Zajac, Coleman, Palmieri and Mirco Mueller each had a takeaway. Next up, the tests get harder as the Devils travel to Pittsburgh on Monday to face the Penguins at 7 PM. They will then complete their first set of back-to-backs, traveling to Ottawa on Tuesday. On another, more positive note, this morning was the “Running with the Devils” 5K charity race and walk at the Essex County Recreation Park in West Orange, New Jersey. I participated in the walk and can say that it was a fun day for all involved that helped raise money for a good cause (RWJBarnabas Health facilities). Seeing the turnout (which including both runners and walkers, was even more than last year) was great considering the weather in North Jersey this morning was not ideal to say the least. Overall, it was a fun day with plenty of money going to good hospitals and the Devils put on a first-class event. The press release says that the broadcasts will be free on Radio.com’s app and website and will also be available on the NHL’s app and website as well as those of the Devils. The first broadcast as part of this streaming service will be the Islanders’ opener against Carolina tonight at 7 PM. The first Devils game streaming will be the opener against the Edmonton OIlers in Sweden on Saturday, October 6. That game is at 1 PM. According to the press release, Sports Radio WFAN 101.9 FM and 660 AM “will promote all live, digital streams and air select head-to-head matchups between the two teams.” This will be the Devils’ 14th season with WFAN as their flagship station. They produced the games that streamed on The One Jersey Network last season in addition to airing select games over the air. This seems like a good deal for the Devils and the Islanders. I am especially excited about the “weekly shows” that the team says they will be developing for this. Unfortunately, they also promised a lot of the same thing for The One Jersey Network and we never really got that. Maybe TOJN was just a stopgap in getting here and we will be seeing this new content developed? Time will tell. The Devils got into penalty trouble early and often and it showed. They fell to the New York Islanders 2-0 at the Barclays Center in Brooklyn to fall to 0-3 in the preseason. Discipline has been an issue for the Devils this preseason and they racked up 30 penalty minutes tonight, giving up two power play goals along the way. The Islanders were 2-for-8 with the extra man. The Isles, by contrast, had only 12 penalty minutes and stopped the Devils on all three of their power plays. The lineup was mostly younger guys and guys on the bubble with only Travis Zajac, Pavel Zacha, Will Butcher and Damon Severson being the established skaters who made the trip to Brooklyn. No Taylor Hall. No Nico Hischier. No Marcus Johansson. It was kind of sink or swim for some of the lineup. In addition, John Hynes was back behind the bench tonight after taking the other night’s split squad games in from up top. The evening began with three straight 4-on-4 situations. Devon Toews of the Islanders was sent off for hooking Brett Seney at 3:29 of the first period while Seney was sent off for unsportsmanlike conduct for “selling” the hook. At 7:12 of the first, New York’s Matt Martin was called for elbowing Colton White and the Devils’ Kurtis Gabriel went off for unsportsmanlike conduct for going after Martin. Then, at the 11:48 mark of the first, the Isles’ Mike Sislo was called for boarding Steven Santini, but the Devils took a too many men on the ice bench minor to even that up. The Islanders finally broke the scoreless tie when, at 18:15 Santini was called for tripping Kieffer Bellows, putting New York on the power play. On that man advantage, Bellows took a backhand pass from Tanner Fritz in the slot and fired it home to give the Isles the 1-0 lead. The Islanders would have a brief 22 second 5-on-3 power play in the second period when Pavel Zacha was called for delaying the game by closing the hand on the puck at 2:13 into the frame. One minute and forty-eight seconds later, Blake Coleman went off for hooking to put New York two skaters up. The Devils would kill that off, but it was indicative of what was going on with New Jersey all night. At the end of the second period, Gabriel took a bit of a run at Isles goaltender Thomas Greiss. That netted him a ten minute misconduct, meaning he would miss half of the third period. The Islanders would double their lead midway through the third when Kevin Rooney was sent off for elbowing Martin at 11:13. On the ensuing power play, Anders Lee scored at 12:21 from Toews and Jordan Eberle to give us our final. Fittingly, both Islanders goals came on the power play. In nets, Greiss and Christopher Gibson split the duties for New York, with Greiss stopping all 25 shots he saw and Gibson all 11 he faced. The Devils finished the game with 36 shots on net and, in fact, had doubled up the Isles after one period of play in that department, 14-7. For the Devils, Keith Kinkaid played the whole 60 minutes and made 25 saves on 27 shots against. Cam Johnson did backup Kinkaid, but the Long Island native got the nod to play the whole game. For the Devils statistically, Butcher led in total time on ice with 22:08 (including 4:28 on the penalty kill and 3:04 on the power play) while Zacha led the forwards with 18:26 (2:34 shorthanded and 3:17 on the power play). John Quenneville and Joey Anderson each had four shots on net to lead in that category. Blake Pietila led in hits with three. So the Devils will try to shake this ugliness off as they head to Manhattan on Monday to play the Rangers at MSG. As usual, we will have coverage of that for you right here. Some site housekeeping to get to as well. If you would like to receive email updates but have not been getting them, please try signing up again with the form on the right side of the main page. Thanks! With the NHL’s regular season schedule being revealed this Thursday, the Devils decided to whet our appetite by revealing their 2018-19 preseason schedule today. Three days later, on September 20, the Devils will take on the Islanders in Brooklyn. On the 24, they will finish up the local part of their preseason schedule at Madison Square Garden against the Rangers. Both New York games are at 7 PM. On the 27th, they then travel to Western Canada to take on the Winnipeg Jets in Winnipeg. That game begins at 8 PM ET. From there, the Devils have quite a bit of traveling to do. They will go from Winnipeg to Bern, Switzerland to take on SC Bern on October 1 (a Monday according to the Devils’ press release). This is part of the NHL Global Series Challenge and is still an exhibition game. The game will take place at PostFinance Arena at 1:30 PM ET here in the United States and 7:30 PM CET in Switzerland. The press release mentions Nico Hischier (a native of Brig, Switzerland) and Mirco Mueller (Winterhur, Switzerland) getting to play in front of their countrymen for the first time as NHLers. The Devils will then kick off their regular season in Gothenburg, Sweden on Saturday, October 6 at the Scandinavium against the Edmonton Oilers. Puck drop for that game is 1 PM ET. That game will be a part of the NHL Global Series. In a bit of a shocking move, the Islanders have reportedly come to terms with former Devils and Maple Leafs general manager Lou Lamoriello. Lamoriello’s contract as GM of the Leafs was up after this season and he was set to take over as a senior adviser. Kyle Dubas was hired as Toronto’s new GM in April. What role Lou will take with the Isles is unclear, he will either be named president of hockey operations, GM or both according to a source close to The Post’s Brett Cyrgalis. This was reported in the Sears Post article. How this directly affects the Devils would be in potentially being a landing spot for Tavares. Should Tavares go to free agency and should he want to stay in the New York Metropolitan area, the Devils would certainly be an attractive landing spot for him. Now, with Lou coming on and with his reputation, Tavares might be less likely to get to free agency and re-sign with New York. Add to that their new arena coming in the next few years and the Islanders are heading in a good direction. Hopefully Lamoriello can help in reestablishing a winning culture on the Island. To be honest, the Islanders have been dormant for too long and having a rivalry between the Devils and Isles would only benefit hockey in the Metropolitan area and the NHL in general. Of course, Lou will always be remembered as the architect of the Devils’ three Stanley Cup winning teams in 1995, 2000 and 2003. He also helped revitalize the Maple Leafs in only two years, showing that he still definitely has what it takes to run a professional hockey team. Lou would also be reunited with his son Chris who works in the Islanders’ front office and previously worked with his dad here in New Jersey. It has been almost a cliche this season to say how the Devils were not picked to be here and that they have defied expectations. But when you really look at how things are going and have gone for this team this season, it truly has been amazing. The Devils defeated the New York Islanders tonight at Prudential Center 4-3. With the Florida Panthers falling earlier in the day to the Boston Bruins, that means that there is five points separating the two teams. The Panthers remain the only threat to the Devils and the magic number is now six. Any combination of six points gained by the Devils or lost by the Panthers will see New Jersey clinch a playoff spot for the first time since 2011-12. We will get to the game in due time, but first, the Devils paid tribute to a longtime treasure of metro area hockey coverage both in print and television. Stan Fischler announced his retirement to come at the end of the season and the Devils paid tribute to him tonight. Former TV colleagues Mike “Doc” Emrick and Chico Resch were on the MSG+ pregame show along with Deb Placey to reminisce about Stan’s 60 years of covering hockey in the New York area. There was even a retrospective on the Matt and the Maven segment that he and Matt Loughlin used to do on Devils’ broadcasts which featured the immortal Chuck the Duck. There was also a special presentation on the big board made to Stan in-game and he spent some time on the broadcast with Ken Daneyko and Steve Cangialosi. Good luck to the Maven in retirement and thank you for the tireless work you did for hockey in the New York metro area. Today was also Stan’s birthday, so happy 86th birthday to him! Now on to the game details. First, on the injury front. Marcus Johansson has been cleared for contact. He has not been cleared to play yet, but has been cleared for contact. Roster-wise, nothing much changed from the OT loss to Pittsburgh. Jesper Bratt, Jimmy Hayes, Ben Lovejoy and Drew Stafford were the scratches. In goal, Keith Kinkaid made the start again, making 27 stops on 30 Islander shots. Coach John Hynes has not announced a starter for the game in Montreal tomorrow (tonight was the start of the Devils’ final back-to-back of the season), but you would have to assume that Cory Schneider gets some work and Kinkaid gets a little bit of a rest going into the playoffs, should the team get there. For the Islanders, Thomas Greiss made just his fourth start since January 14. He made 31 saves on 35 Devils shots. Things looked bad for the Devils just 1:15 in as the Isles got on the board first. Tanner Fritz scored then from Brandon Davidson and John Tavares to give New York the 1-0 lead early. The bad news was that Kinkaid had let in a goal within the first two minutes of a game again. The good news is that when that happened, the Devils were 8-3 coming into tonight. They would be 9-3 before the end of the night. It started at the 7:54 mark when Stefan Noesen scored from Blake Coleman and Will Butcher. Coleman sealed off an Islander behind the New York net. He took the puck to the front of the net and slid it to Noesen who was cutting towards the net. Noesen stuffed it in to make it 1-1. Things were beginning to turn. Noesen was playing in his 100th game as a New Jersey Devil tonight so congratulations to him. Also, with the assist, Butcher took over the franchise record for assists in a season by a rookie defenseman with 38. He passed Barry Beck, who set the previous record of 37 when the team was in Colorado. Kinkaid was shaken up by a high shot by Anthony Beauvillier to the collarbone late in the first period, but would shake it off. The Devils would lose Travis Zajac briefly late in the second, but he would return. Also, Kyle Palmieri took an errant Andy Greene stick to the face just below his right eye in the middle of the third period. He would not return and Hynes had no update on his condition in his post game presser. The second period was a busy one for both teams. It began with Taylor Hall scoring on the power play from Butcher and Palmieri just 41 seconds into the second. Anders Lee was called for tripping at 19:11 of the first, giving the Devils 1:12 of power play time on fresh ice in the second period. Hall worked it to Butcher at the near point. Butcher gave it back to Hall along the half wall and Hall found room, then fired a pass towards a cutting Palmieri. The puck took a fortunate bounce off of the New York D-man’s skate and past Greiss. It was 2-1 Devils. Hall now has points in seven straight games. And his magic was not done. He scored again at the 9:08 mark of the second from Noesen to make it 3-1 Devils. Noesen jarred the puck loose to Hall in the Devils zone. He then took it all the way up ice, using his speed to push the Islander defense back on their heels. Once he had gained the New York blue line, he fired from the hashmarks inside the slot, beating Greiss glove side. It was a beautiful play, as Hall winded his way up ice and just sliced through the New York defense. The Devils now had a two goal lead, but the Isles would just not go away. At 11:22, Patrick Maroon was called for tripping and the Islanders were on the power play. Beauvillier scored when his shot was tipped by the Devils’ Brian Gibbons in front and beat Kinkaid up high. Mathew Barzal and Brock Nelson had the assists on that one. Overall, on the power play for the night, both teams were an exact 1-for-2 with three shots. The difference for the Devils was when Damon Severson went off for holding at 18:27. Things seemed to be going in the Isles’ favor and the momentum was shifting. But, at 18:58, Blake Coleman would score shorthanded from Mirco Mueller and Michael Grabner to make it 4-2 Devils. Mueller skated the puck out of trouble into the New York zone on a 2-on-1 with Coleman. He drew the defender towards him and then passed to Coleman, who roofed a wrister by Greiss stick side to double the Devils’ lead. The Islanders would end the second period with 27 seconds still left on that power play and nearly gave up another shorty early in the third. Grabner skated in all alone on a breakaway, but was stopped by Greiss, who was single-handedly keeping the Islanders in the game. The Devils would spend most of the third period in the Isles’ zone with great offensive zone pressure. They were killing the clock, but could just not solve Greiss. That would come back to bite them when, at 16:21. Chris Wagner redirected a Johnny Boychuk shot by Kinkaid to cut the Devils’ lead to 4-3. Nick Leddy had the secondary assist. We were in for a wild finish. Greiss went to the bench with about 1:30 left in the game for the extra skater. The Devils endured about three key faceoffs deep in their zone, but were finally able to get the puck out after Noesen had a timely blocked shot. It was a nailbiter, but the Devils got the W, with Keith Kinkaid notching his 23rd win of the season. Stats-wise, the Devils outshot the Isles 35 to 30, won 43-percent of the game’s faceoffs, out hit the Islanders 31 to 13 and doubled them up in blocked shots with 12 to New York’s six. Sami Vatanen once again led in time on ice by a wide margin with 27:15 – including 27 seconds on the power play and 2:18 on the PK. Hall led in shots on goal with six, Coleman led in hits with five, blocks were led by Coleman, Gibbons, Grabner, Mueller and Vatanen with two each and Hall led in takeaways with three. In the end, four Devils had multi-point nights: Hall with two goals (although he could have had at least two more, it seemed – he was that in control of the game), Coleman with a goal and an assist, Noesen with a goal and an assist and Butcher with two assists. Hall was named the game’s first star, Butcher the second and Noesen the third. Next up, the Devils travel up to Montreal to take on the Habs in the back end of their final back-to-back of the season tomorrow. Florida has a back-to-back beginning Monday when they take on the Hurricanes. We will have you covered here tomorrow as the Devils take on the Montreal Canadiens. Note: if you enjoyed this post, please do not hesistate to follow us on Twitter @LGDevilsNet. You can also email us at LetsGoDevilsNet@gmail.com or simply leave a comment in the comment section below each post. Last night, the Devils honored a legend by retiring the number of their greatest offensive player ever. There were many former players and Devils greats in attendance to help pay homage to the past glories of a great franchise. But the current team made a big step of their own, getting a big Metro Division win in a tight race in come-from-behind fashion. 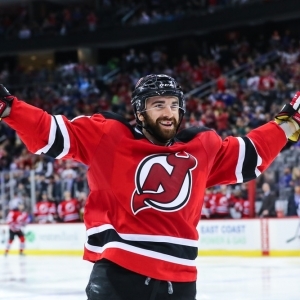 The Devils defeated the New York Islanders 2-1 off of two goals from Kyle Palmieri. 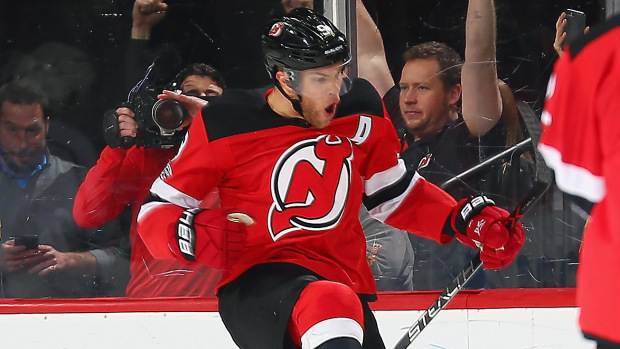 Taylor Hall assisted on both goals to extend his personal point scoring streak to an amazing 21 games total. First the ceremony. It was very well done by the Devils organization and featured prominent Czech players from Devils history who were also teammates of Elias’ both on the Devils and internationally. Players like Marek Zidlicky, Bobby Holik and his A-Line linemate, Petr Sykora. Among other teammates present were: one of the all-time underrated Devils, Sergei Brylin; Michael Rupp – who won a Cup with Elias in 2003; former Devils goalie Kevin Weekes; former Devils captain turned broadcaster Bryce Salvador and former Devils coach Robbie Ftorek, who also coached Elias with the AHL’s Albany River Rats. Also present were the four previous Devils to have their numbers retired: Scott Stevens, Ken Daneyko, Scott Niedermayer and Martin Brodeur as well as dignitarites like current Devils GM Ray Shero, ownership and NHL Deputy Commissioner Bill Daly. Elias’ family including his wife, children, parents and brothers were also in attendance. Devils radio play-by-play man Matt Loughlin emceed the event and there were speeches from Stevens (representing past players), Josh Harris and David Blitzer (respresenting management), Daly (representing the NHL) and Travis Zajac (representing the current players – Zajac also spent about ten years as Elias’ teammate and is a close friend of his). There were also taped comments from former Devils general manager Lou Lamoriello (who is currently busy with the trade deadline for the Toronto Maple Leafs). In addition, the fans voiced their approval with chants of “Patty! Patty!” throughout the proceedings. Highlight videos were shown, of which there are many to choose from for the man who is the franchise’s all-time leading scorer in goals, assists and total points. The main focus of most of the speeches was that Elias was the offensive heartbeat of a team that was known as being very defensive during it’s heyday. 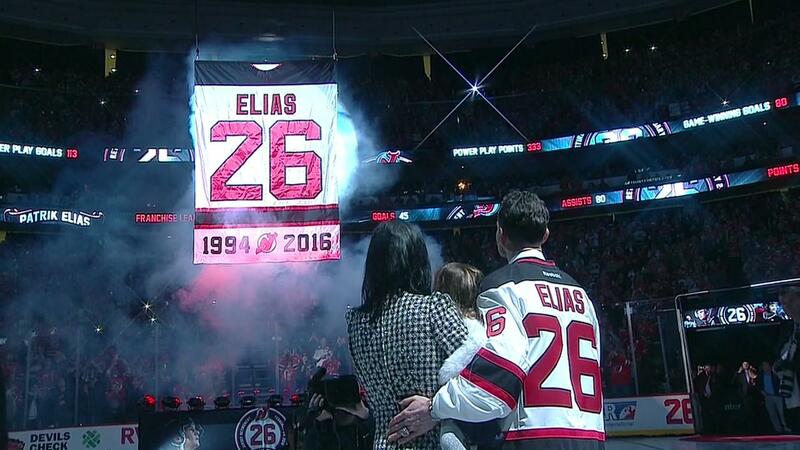 Once the speeches were done, the banner featuring Elias’ number 26 was raised to the rafters of Prudential Center, never to be worn by a Devils player ever again. Throughout the night, there would be taped segments shown on the big video board featuring fans and former teammates (including Zach Parise, who took the ceremonial faceoff with Andy Greene when Elias dropped the puck last game versus Minnesota) giving their memories and impressions of the career of Patrik Elias the player and the man. But there was still a game to be played and one that was very important at that. The Devils had a lot on their plate with the Islanders. But they also had the debut of former-Islander Michael Grabner, acquired from the Rangers on Friday. Roster-wise, he was in at forward while Jimmy Hayes and Mirco Mueller were the scratches. WIth Cory Schneider still out, Long Island-native Keith Kinkaid got the start against his boyhood team. He made 30 saves on 31 New York shots. He also came up big when he needed to, playing a good game once again. Kinkaid is a solid backup and has largely played very well in his recent time in the spotlight. Against him was Jaroslav Halak for the Isles. He stopped 31 of 33 shots faced. The game was pretty cleanly played and the officials let a lot go, as evidenced by the three power plays total in the game. The Devils were 0-for-1 with four shots on their man advantage while the Isles were 0-for-2 with a pair of power play shots. Following a scoreless first period, it was the Islanders who got on the board at 3:55 of the second period. Jordan Eberle scored from Anthony Beauvillier and rookie phenom Mathew Barzal. That made it 1-0 New York and it would stay that way through the second intermission. It seemed we were headed for a defensive struggle, possibly one the Devils would lose until an inspired Kyle Palmieri basically took over the game. He tied it up at 6:35 of the third period off assists from Hall and Nico Hischier. It came when Hischier made a nice defensive play in the Devils’ end to chip the puck up to Hall along the far boards. Hall gave it to a streaking Palmieri who skated up the left wing. He pulled the puck by an Islander defender just inside the New York blue line and fired at the top of the faceoff circle, beating Halak glove side to tie things up at one. It was a nice goal and one that almost caught the crowd by surprise, he snapped the shot off so fast. With the assist on that goal, Hall extended his point streak to 14 games straight and 21 total. But the Palmieri/Hall show was not over. Palmieri notched the game winner at the 11:11 mark of the third period. He got assists from Sami Vatanen and Hall. It occurred when Hischier won a board battle behind the Islander net and kicked the puck over to Hall in the far corner. Hall, who is having his number retired by the Windsor Spitfires on Sunday, wound the puck around the boards to Vatanen at the near point. Vatanen fired on net and Palmieri, camped in front of the net, tipped it by Halak to make it 2-1 Devils. And that is where it would stand. The Isles would pull Halak with about 1:30 left in the game, but the Devils weathered the storm and pulled out the victory. Kinkaid would be named the game’s third star, Hall the second and Palmieri the first. Both of Hall’s assist announcements were met with chants of “MVP! MVP!” from a crowd hoping the NHL rewards Taylor’s heart with Hart this summer. Vatanen led the team in ice time with 23:09, Palmieri led in shots on goal by a wide margin with eight, Brian Boyle and Andy Greene each led in hits, throwing four of them, Greene also led in blocks with three and Blake Coleman (who switched his jersey number to 20 with Grabner taking number 40) led in takeaways with two. The Devils won 47-percent of the game’s faceoffs. Grabner played well in his debut, firing two shots on net with an even plus/minus rating and a takeaway. He did that in 13:34 of ice time (1:53 of which was on the penalty kill). Next up, the Devils will face another stiff divisional test as they head to Pittsburgh on Tuesday to take on the Penguins. Hopefully they can carry over the momentum of a hard-fought, emotional win on what was a very emotional night. If you enjoyed this post, please follow us on Twitter @LGDevilsNet. You can also email us at Letsgodevilsnet@gmail.com. Or simply leave a comment down below. Note: the photo of Patrik Elias’ retired number banner at the top of this post was downloaded from 24-hours-news.com.